In this video we will discuss using FormCollection object in mvc and it's purpose. Please watch Part 12, before proceeding with this video. FormCollection class will automatically receive the posted form values in the controller action method, in key/value pairs. Keys & values can be accessed using key names or index. We can use the FormCollection to loop thru each key and it's value that is posted to the server. Add the following method to EmployeeBusinessLayer.cs file. To save form data, to a database table, copy and paste the following code in EmployeeController.cs file. Do we really have to write all the dirty code of retrieving data from FormCollection and assign it to the properties of "employee" object. The answer is no. This is the job of the modelbinder in MVC. We will discuss modelbinders in our next video. Cant seem to get mine to work. I get the "Cannot insert the value NULL into column 'Id', table 'Sample2.dbo.tblEmployee'; column does not allow nulls. INSERT fails." exception. Have I done something wrong in the database? Nowhere in the code do we set the id for the Id column in the database which is my problem. How can I correct this pls. Hi Bard de Klerk.In table u didn't declare primary key that ways u get that exception.you will keep primary key in u r table. You need to set the primary key to auto-increment, or else if you have a non-nullable column, with no default value, if you provide no value it will error.To set up auto-increment in SQL Server Management Studio:Open your table in DesignSelect your column and go to Column PropertiesUnder Indentity Specification, set (Is Identity)=Yes and Indentity Increment=1 But I had to make a new table to set this property..
give problem string coversion.what i'll do for this? how to resolve error "Keyword not supported: 'metadata'." Please help me. where u got this error? metadata is a reserved keyword in C#. 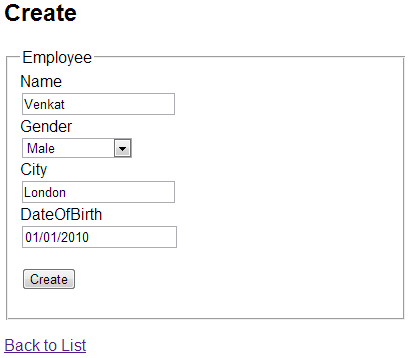 Try some other name if you are planning this 'metadata' name as a variable's name. Thank You very much sir, I really acquire more knowledge by your lovely tutorials. Procedure or function 'spAddEmp' expects parameter '@Name', which was not supplied. Sir, How can we post list of object from view to controller?